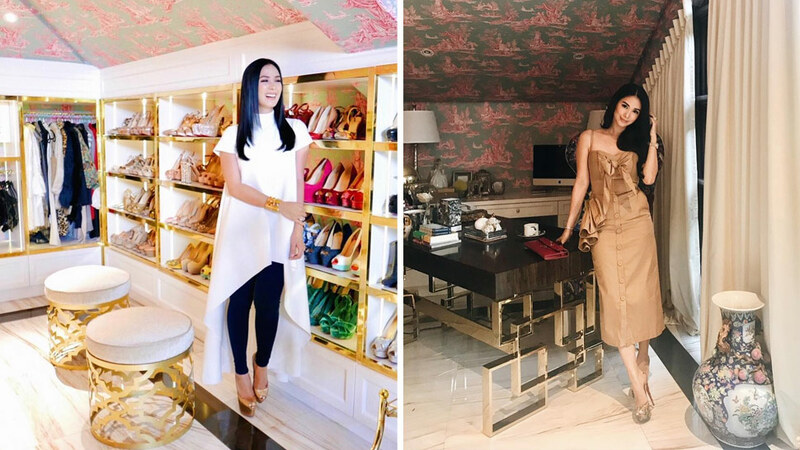 If you’ve seen photos of Heart Evangelista’s new home in Quezon City, we’re sure you’ve marveled at the well-chosen accessories, fancy table settings, and the rooms that speak of the actress’s impeccable taste. A quick browse through her Instagram account will give followers a peek into one of the must-see parts of her home—the envy-worthy walk-in closet. Who wouldn’t be intrigued? A whimsical flight of steps leads to the lovely boudoir, the shoes are neatly kept in shelves, and there’s a spot where Heart can work on her makeup, too. Aside from these details, the well-thought-out furniture pieces and accessories also stand out. From the wallpaper and seating pieces to the desk and soft furnishings—it’s easy to see that the room was designed with Heart’s style and personality in mind. In a corner of her walk-in closet, a table with an interesting gold base can be seen. It’s safe to say that it’s meant for quick work tasks and even reading. Placing it near a source of natural light is a definite plus! Shop for a similar desk with a metal base and leather top at Bernhardt PH. Check out the Jet Set or Soho Luxe desks. Trying out different looks and fixing that beautiful mane can be extra exciting with a Tres Marias mirror—the mirrored top and base make the piece extra sleek! Ito Kish’s Sagrada mirror from his new collection is an equally beautiful find that will complete your space. Click here to learn more. Comfy and sophisticated stools are must-haves when trying on shoes. For similar pieces, the Resort collection of Moss Manila Home may have the pieces that you need. Loved the walls of Heart’s walk-in closet? Find a Toile de Jouy wallpaper that matches the look you have in mind at Studio Eleven. Allocate a spot where you can relax, read a book, or enjoy some refreshments. Furnish a corner of your room with the "Cuddle Up" sofa from Caracole that’s similar to Heart’s own couch. What’s a sofa without two or more fluffy buddies? You can buy printed slub-weave and luxurious pillows at budget-friendly prices (from P599 to P899) when you visit H&M Home. Visit itokish.com for more details. MG Building, 150 Amorsolo Street, Legaspi Village, Makati City. Lot 2 Block 32, 38th St., Bonifacio Global City, Taguig. G/F SM Makati, Hotel Drive, Makati City.